My name is John and I am aclassic car enthusiast from Athens, Greece. If things go as planned, I will soon be the owner of an Austin Mini Moke. It happens to be one of the Mokes used by Aristotelis Onassis at his private island of Skorpios. 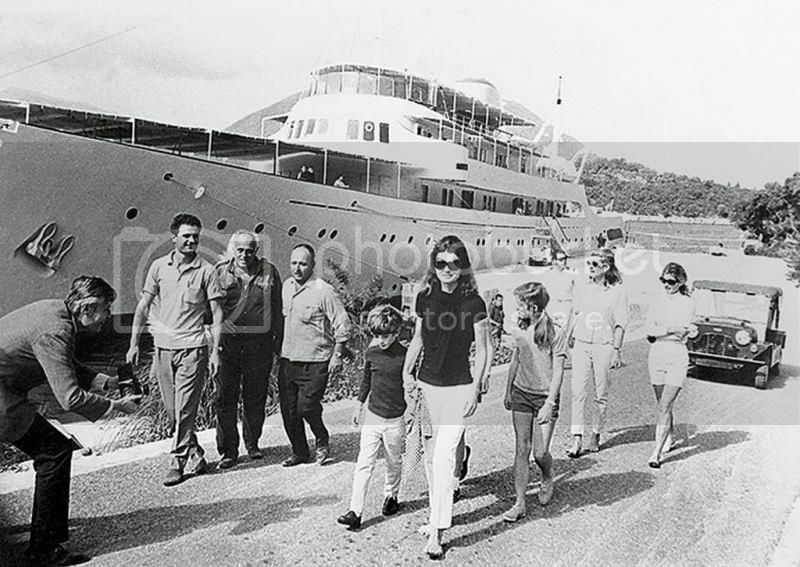 A mythical island in the Adriatic sea where mr. Onassis spent quality time with his choice female companions, among others Jackie O. and Maria Kallas. He was also seen driving away from his wedding with Jackie in one of them. Hope it come together for you. Nice photo too by the way. There were a few of them on the island. I do not know the exact number yet. The research has just begun. Ok. I finally got some pics, and will get some more detailed ones tomorrow. What I would love to hear from the experts is that it looks like a mk1 shell. I do not know the differences in the body panels between UK and Portuguese built Mokes. 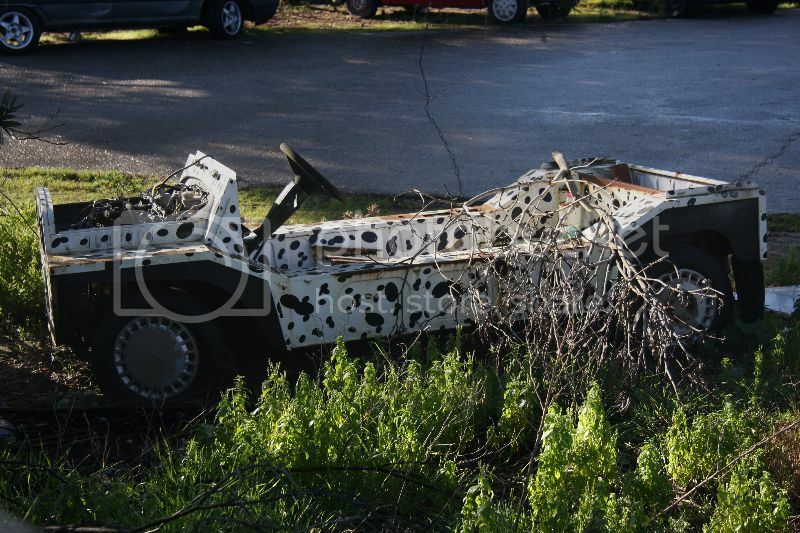 Here is a pic of a car that is still on the private island, with the daughter of the new russian owner. That should also be a British Moke. 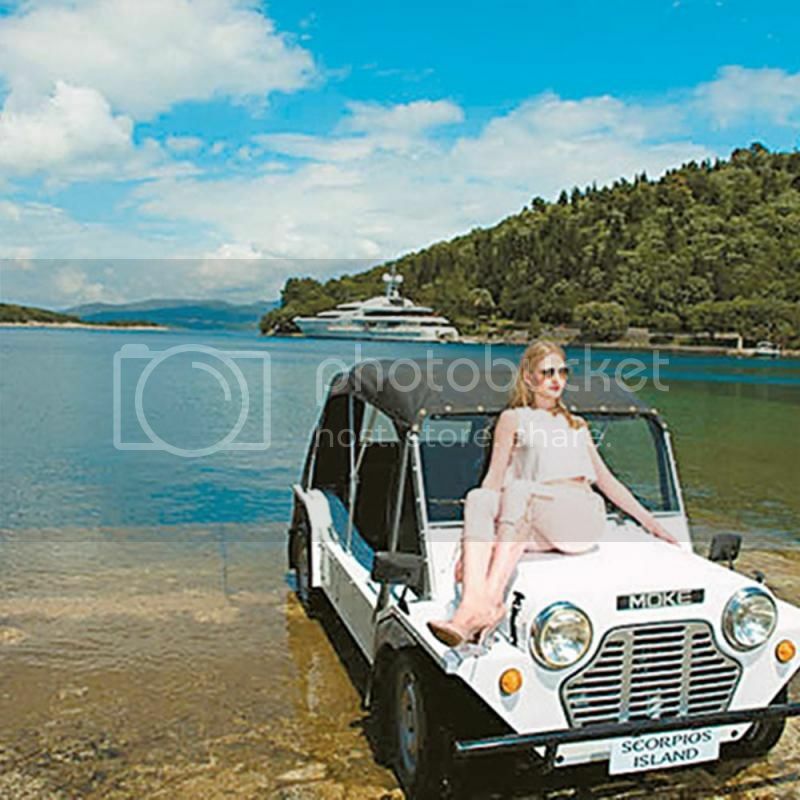 The white Moke on Skopios with the very attractive Russian lady sitting on the bonnet is meant to have an electric motor in place of the original A series engine. According to the magazine articles I've seen both in English and Greek, the conversion was done by Aston Martin. (Do I speak Greek? No but Google have a very good translation website!) Having contacted the archivist at Aston Martin they know nothing about this! In any case it doesn't seem the sort of thing that Aston Martin would ever have been involved in. However we now think that the word 'Austin' was lost in translation and it appeared in Greek circles as 'Aston'! So that then begs the question if it wasn't Aston Martin, did Austin ever build an electric Moke c. 1970 for use on Skorpios? I have yet to find evidence that they did but I would be delighted if proved wrong! I had also seen the article. Knowing how clueless greek gossip journalists are about older cars, I can guarantee they mistook Austin for Aston. 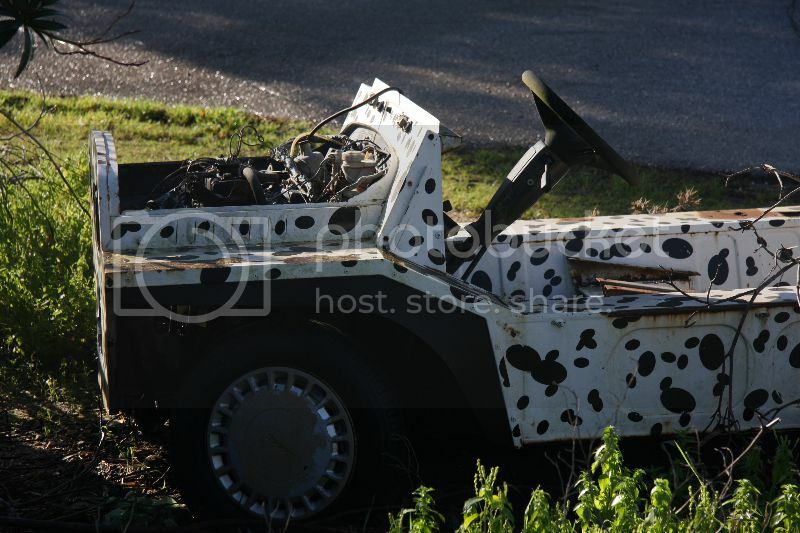 Now that the car I originally thought was t a UK Moke is not and not linked to Onassis as directly as I would like, I am not sure I want to go through with the purchase. After I look at the new pictures tomorrow I will decide. Hi, apologies for the late reply I've only recently rejoined the forum and read this interesting post. About 15 years ago I had quite a fascination with Skorpios and the Onassis Mokes. We were at the time repeat visitors to the nearby tourist island of Lefkas (Levkas) and I found out quite a bit about them. Whilst on a boat trip around the island one day I was amazed and delighted to see a Moke parked by the quay in Skorpios harbour. I did some research, and asked some locals in Lefkas about the Mokes. I managed to track down a guy whose father worked on the island, he was very cagey and protective when I asked questions, even though I explained that I owned a Moke and was at the time on the Moke Club committee. Onassis was (and still is) a legend in Greece, a national hero so his staff were very protective and wary on his behalf. I wrote down my questions and met up with him a day or two later, when he had received the answers from his father. I think I wrote an article about it in the club magazine at the time, but anyway what I remember is that there were at the time a total of 8 Mokes on Skorpios. One original 1960s English Moke (green) which was the one Onassis & Jackie O got married in, seen in the above photos and on Pathe news. I've separately seen some tv / documentary footage of that Moke driving up a hill on Skorpios with Jackie O in the back. You see the car stop, she gets out and walks down the the water, dives in and swims out to the yacht Christina. Has anyone else seen this? As well as the green English Moke there were 7 later cars, all white I think, Portuguese made. At the time I asked if they were having any trouble getting parts to keep them running, and asked if they had heard of the Moke Club as we would love to help them by supplying parts or advice etc. They replied they were struggling to keep them going. As the island was at the time owned by a trust for Athena Onassis (who wasn't interested and eventually sold Skorpios when she could) it was very difficult getting in touch with anyone who was looking after the Mokes. I think I did some research and wrote to them offering assistance but never heard back, and I don't know if they ever ordered any parts from the Club. So there were 7 white Portuguese Mokes on the island, it wouldn't surprise me if at least one has been converted to electric power. The Moke is after all the perfect vehicle for a private island. Take a Google Earth look at the twisty roads on Skorpios and you'll see what I mean. I always wondered what might have happened to all those 8 Onassis Skorpios Mokes. Especially the green one. That would be worth a fortune I guess.